Jodie Glen-Martin graduated with honours from De Montfort University in conservation and restoration in 1995. She then worked for a leading international conservation company based in London for over a decade specialising in the use of painting, gilding and lacquer techniques on wall and ceiling paintings and sculpture. During this time she also produced her own work, mainly painting on canvas. 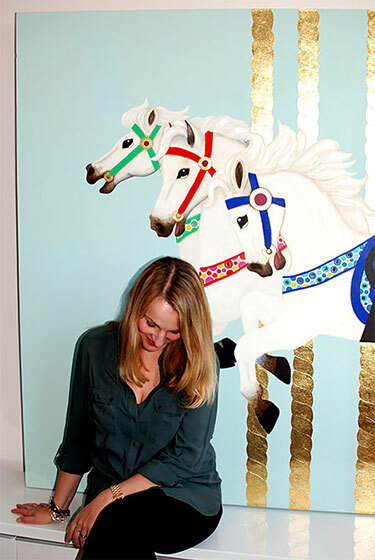 Her move to Tate in 2004 inspired her to combine historic decorative techniques with contemporary and modern design and resulted in a rapid growth in output. Working from her West London studio, Jodie focuses on familiar objects, capturing elements of their two dimensional form and experimenting with scale and repetition to create energetic discordant patterns. She works principally in acrylics and metal leaf on canvas, using detailed brushwork and gilding. Despite this use of traditional techniques, her work is deliberately anti-nostalgic using box-fresh colours and graphic clarity suggesting manufactured uniformity. The eye is challenged to balance the repetitive rhythm of the fragments with the vibrant contrast of colours and discordant patterns.